I have a confession. 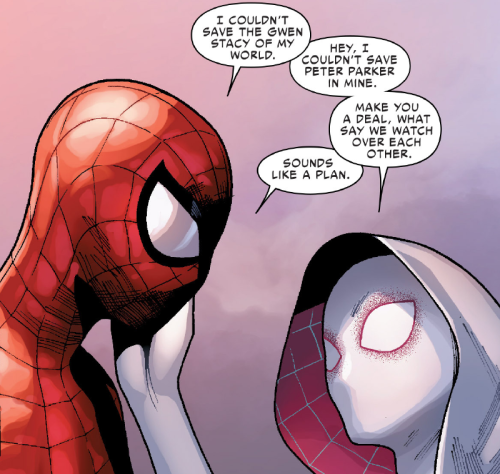 I love Spider-Gwen. I have not read a Marvel Comic in years, decades even. When I was reading it my favorite was Spider-Man. Spider-Man was really only 2nd to Batman in my mind. So I have REALLY been enjoying the new take on the Spider-Man story in the form of Spider-Gwen. So here is some Spider-Gwen (I know properly "Spider-Woman") art. And this one. This is what sold me that this was going to be awesome. They were not made into a love interest for each other despite their past. Maybe because of it. Now I understand that she is being added to the "core" Marvel-verse. That's pretty cool. Started reading about her a few weeks ago and I have to agree with you, I enjoy the way she is being depicted! I haven't read any comics since the 1960's. Well other than the Zapp comics I used to read at my friends' houses in the '70's--Furry Freak Brothers, ,Mr. Natural, and stuff like that. The Marvel artwork looks a lot more hip now. I remember when the idea of Spider-Gwen was first floated around /co/ as an AU for the Spectacular Spider-Man cartoon series. She's come so far and I gotta say, not many characters have excited me as much.